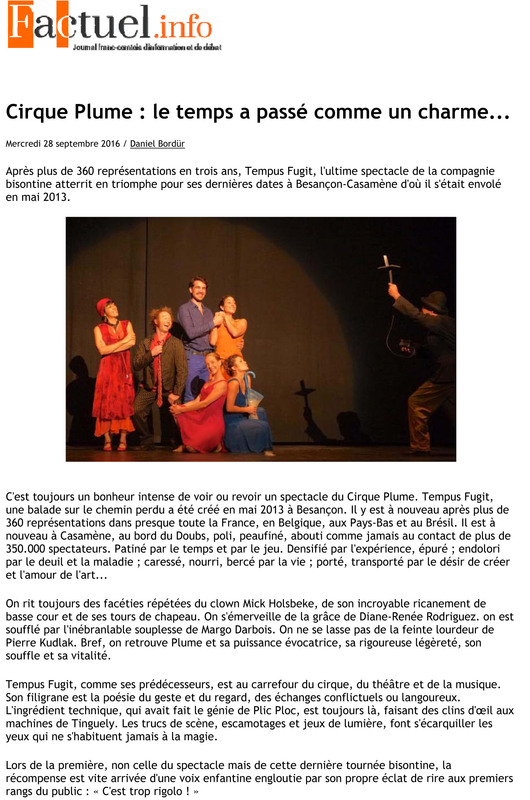 After more than 360 performances in three years, Tempus Fugit, the latest show by the Besançon-based company, landed triumphantly for its most recent bookings in Besançon-Casamène, the very place from which it took off in May 2013. It’s always an intense joy to watch or to rewatch a show by Cirque Plume. Tempus Fugit, une ballade sur le chemin perdu was created in May 2013 in Besançon. It’s here once again after over 360 shows in just about all of France, in Belgium, in the Netherlands, and in Brazil. Back in Casamène, on the edge of the Doubs, it is polished, refined, consummate as ever after contact with 350,000 spectators. Smoothed by time and performing. Thickened from experience: pared down; aching from grief and sickness; caressed, nourished, cradled by life; carried, transported by the desire to create the love of art. The clown Mick Holsbeke’s gags always make us laugh, with his incredible barnyard banter and his hat tricks. We marvel at the grace of Diane-Renée Rodriguez. We areblown away by the unyielding suppleness of Margo Darbois. We never tire of Pierre Kudlak’s feigned unwieldiness. In short, we find Plume once again in all its evocative power, its rigorous lightness, its breadth, and its vitality. Tempus Fugit, like its predecessors, is at the crossroads of circus, theatre, and music. Its filigree is the poetry of gesture and gaze, of conflicting or languid exchanges. The technical ingredient, which was the genius of Plic Ploc, is still there, a slight nod to Tinguely’s machines. The tricks of the stage, the retractions and games with light, cause our eyes—which never completely get used to this magic—to widen.